This is the 2nd annual Eastside Hill Kubb Derby. Our neighborhood Kubb derby is played in the spirit/tradition of soccer derbies in England. In England, many soccer teams will originate from a neighborhood and play other clubs or teams throughout the area. However, once a year, the neighborhoods all come home and will play in a Derby. In this Derby, neighborhood teams play each other, and the winners receive the honor of flying a special flag for the following year. The Eastside Hill Neighborhood has a great Kubb tradition which we’d like to continue to grow throughout the entire neighborhood. The U.S. National Kubb Championship? was initially played in our very own Boyd Park. Proportionally, we generate the greatest number of Kubb players and teams playing the Championship. Also, half of the American team that took 2nd place at the 2014 World Kubb Tournament in Gotland, Sweden was from the Eastside Hill. When: Sunday, August 23, 8:30am–1pm. Check in and warm up at 8:45am; play is from 9am–1pm. Playoffs will start at 2pm. Free food at the Eastside Hill Neighborhood picnic (noon–2pm)! Come out to enjoy Kubb, community and food! Requirements: Players must live in the Eastside Hill Neighborhood. All ages and abilities are welcome! We will teach those that have not played! (It’s easy to learn, and fun to play!) Teams may have 2-6 members. 2. Number of players (teams can have between 2-6 players). 3. Name of the team captain and their contact info. If you want to play and don’t have a team, email Gina, and she can help you connect with other players. Champions: Champions of this Derby receive the honor of flying the Eastside Hill Derby flag for the next year! 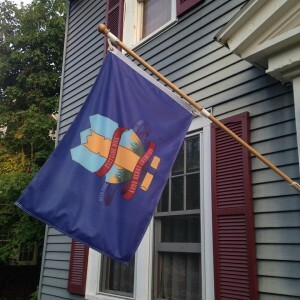 We have an awesome flag that was created by Lori Chilifone, an artist in the neighborhood. So get your flagpole ready and register ASAP! Share in the joy of developing community and tradition on the Eastside Hill.